While I'm thinking about it, I thought I might share the recipe for the pink salad I made at Christmas--and for many, many other holiday occassions, too. It's one of my favorite things and it's so, so easy to make. Just four ingredients, so here goes. . . 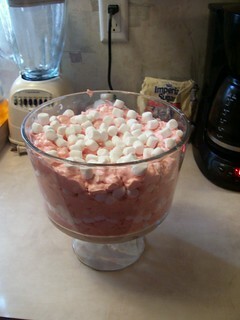 Fold the cherry pie filling, cool whip, and marshmallows together, in a large bowl. Take care to fold and not stir or beat, cool whip is pretty sensitive and will deflate if you mess with it too much. The color should be a pretty pink. Drain crushed pineapple until it's as dry as you can get it. This is significant because the acid in the pineapple juice don't play nice with the other ingredients. Once it's as rung out as it can be, fold it into cool whip mixture. Chill for several hours. If we're being honest, chilling isn't completely necessary, but this salad tastes better the second day than it does the first. It's good both days, I usually make it the day we're going to eat it, but after it's been in the fridge a while the flavors all have time to come together. It's amazing. I love having left overs! Enjoy!